With the official Twitter application leaving us a bit lacking, the market for third party applications is ripe for the picking. A few weeks ago we first brought you to Boid, an application that adheres to the Android Design code and looks to have a lot of promise. What we now bring you is a sneak peek of the next big third-party Twitter application, Carbon for Android. It is impressive to say the least. If Carbon sounds familiar you shouldn’t be surprised. They made their name by building quality Twitter clients for webOS devices. They just recently released an application for Windows Phone 7 and now they are taking the experiences from those two applications and putting it into an Ice Cream Sandwich-inspired Android application. The transitions are smooth and the user interface is slick. 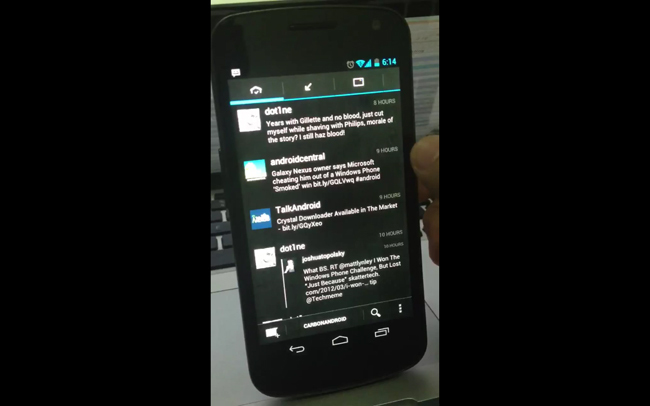 The video shows off multiple Twitter account support while still following their overall design. It looks buttery and makes me want to get my hands on it as soon as possible. Carbon has been hard at work getting things ready behind the scenes and they promise a beta to be released fairly soon. Personally, I cannot wait. What do you think?